If love hurts then young love hurts best. Love is never quite so raw, so giddy, so boundless, or so terrible when we are older. Or should I say (at 29) it probably is – but no-one really wants to watch a pair of wrinkly star cross’d lovers. Young love exerts a hold on our imaginations when we’re young because it’s the fullest expression of our heart’s desire not to be like our parents (boring, boring, fusty and dulled). When we are parents, young love reminds us how incandescent it is to be young. Romeo + Juliet is a story of young love as much because it’s a tragedy as it is because it’s a romance. Young love always dies in some form. It has to, as we age. Romeo and Juliet (in Baz Luhrmann’s movie) live in Venice Beach instead of Fair Verona, but it’s very much a fantasy-version of a real place. Rio de Janeiro’s famous Christ the Redeemer statue watches over this Venice Beach, and although it’s inhabitants dress and act the part of late 20th century teenagers, they all speak Shakespearean verse. Luhrmann makes things coalesce by homing-in on the essentials of the original text and finding modern equivalents. So the clan war between Montague and Capulet becomes a gang war; the Prince of Verona becomes a Police Chief and swords are turned – not to plough-shares – but to handguns (a sort-of Tarantino-riff on Isaiah 2:4). Romeo meets Juliet at a party; they first glimpse each other from opposite sides of a fish tank. As silly as this moment sounds, it’s lyrical to watch. Director Baz Luhrmann has a knack for making goofy things meaningful. As we look at Romeo looking at Juliet and Juliet starring back – their images at once both magnified and distorted by water – it’s as if this is how love makes them look to each other; not-quite-themselves and somehow bigger than life. Romeo + Juliet is a movie that risks everything to capture the risk-embracing nature of young love. It couldn’t succeed without being foolish. From Mercutio in drag to Friar Laurence’s crucifix tattoo – there is a devil-may-care spirit to the production that fits its subject matter (this isn’t Ibsen, for crying out loud). Plot-wise, post-fish tank, Luhrmann sticks to Shakespeare’s outline: the marriage, the street brawls, Romeo’s banishment, and the deaths – aren’t tampered with. 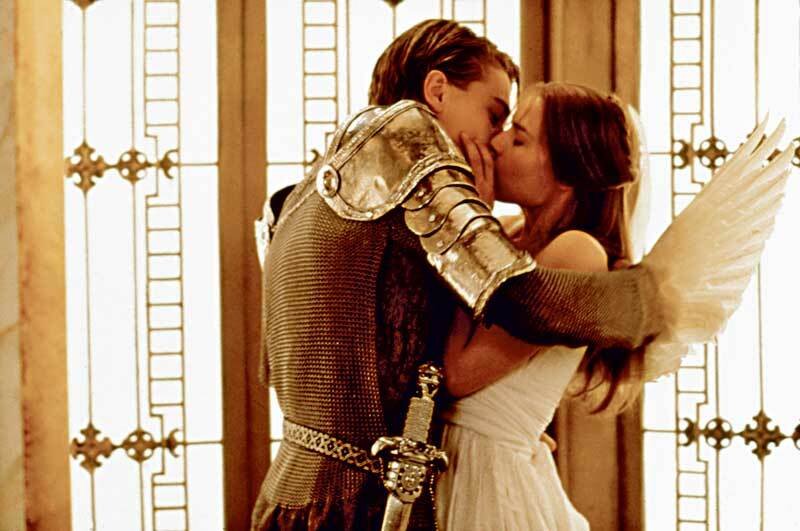 Leonardo DiCaprio and Claire Danes are right for their roles because of the Romeo + Juliet they’re in, rather than because they’re the world’s best Romeo and Juliet. DiCaprio is by turns vain and intoxicated as the mood takes him – more convincing perhaps as a teenage lothario, but anguished with the best of them (and always effortlessly cool). Danes is a klutz by nature and makes a klutzy, supremely appealing Juliet. She is innocent as a milk carton right from her first entrance and delivers her post-marriage, pre-wedding night soliloquy (“O, I have bought the mansion of a love/But not possess’d it”) with unabashed joy. True, one could fault each of them for their line readings at times (Danes fudges some of her couplets in the swimming-pool scene and DiCaprio doesn’t always sound like he understands what he’s saying), but you feel that they feel love – which is more, because words are like wet cement unless they’re felt. No-one can say what Shakespeare intended in writing Romeo and Juliet. There are snide theories that it’s intended as a satire on young love, but I don’t think the guy who wrote King Lear got off on winking as people die. Luhrmann’s version, to me, catches the heart of the play, which is a young heart – the very reason Romeo and Juliet find it so easy (so enticing even) to contemplate death. Love in Romeo + Juliet is obliterating, it swallows life, but no-one’s scared of it. The difference between old love and young love is that old love seeks to protect itself. Young love is incandescent. When young lovers protect themselves they don’t mature – they dim. This entry was posted on Sunday, October 14th, 2007 at 3:49 pm and is filed under American Film, Film Reviews. You can follow any responses to this entry through the RSS 2.0 feed. You can leave a response, or trackback from your own site.